Making pesto with a mortar and pestle is satisfying and the result is quite different to a food processor. 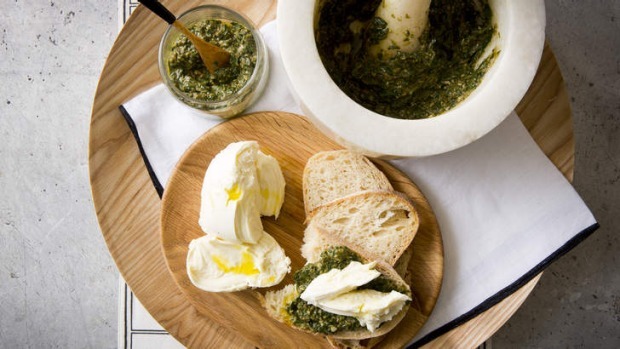 Pesto is great with lamb, tossed with pasta or gnocchi or slathered straight on bread with goat's cheese or ricotta. 1. Cut the garlic cloves in half and blanch them in boiling water for two minutes, then drain and refresh in cold water. 2. Add the blanched garlic to the mortar along with a good pinch of flaked salt and grind to a rough paste. Add the pinenuts and cheese, grind lightly, then start adding the basil leaves a few at a time. As you go, add a little water (in all, you will add about 60 millilitres) and a little oil, then more leaves, until you have a coarse paste. Grind in some pepper to taste and use or store for later use. Tip: Store in a small jar with a layer of olive oil on top of the pesto to stop it from oxidising. After using, scrape down the sides of the jar and wipe with a paper towel (otherwise the exposed residue will blacken) and cover again with oil.